Happy Thanksgiving. I hope you have a restful and enjoyable day with your loved ones. I will be busy in the kitchen keeping my turkeys at home stuffed today. We have already started with cream cheese danishes for breakfast. 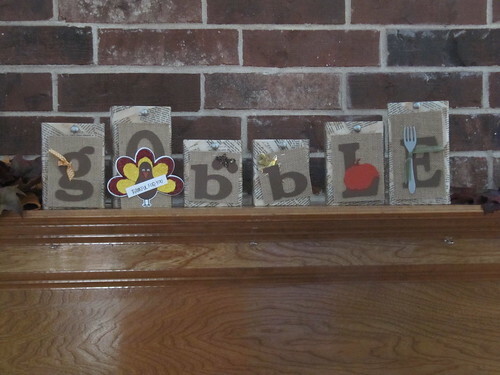 Today I wanted to share my gobble tags that I put on my decor blocks. I just love this little turkey. He is the star of the set! My friend had a random sizzix die with the fork and I finished off the acorns with some chunky glitter for the tops. I have had a lot of fun making tags to display on the blocks. 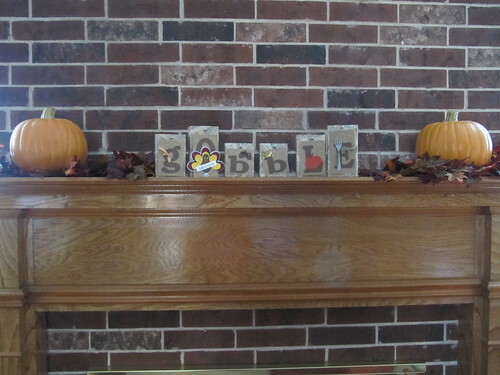 Here is the set on my mantle with some leaves and pumpkins. After today we are ready to decorate for Christmas so I will get to pull another set of tags out!